Your pet's daily 'bread and butter': Natural Hay with Marigolds is a carefully a dried and packaged product. This helps preserve all the vitamins and provides a healthy, natural addition to your pet's daily diet. The hay is rich in healthy fibres and tastes of delicious herbs. Hay is an eΒential part of plant-eating small pet or rabbit's diet, so plenty should be provided (roughly 2 handfuls per pet per day). 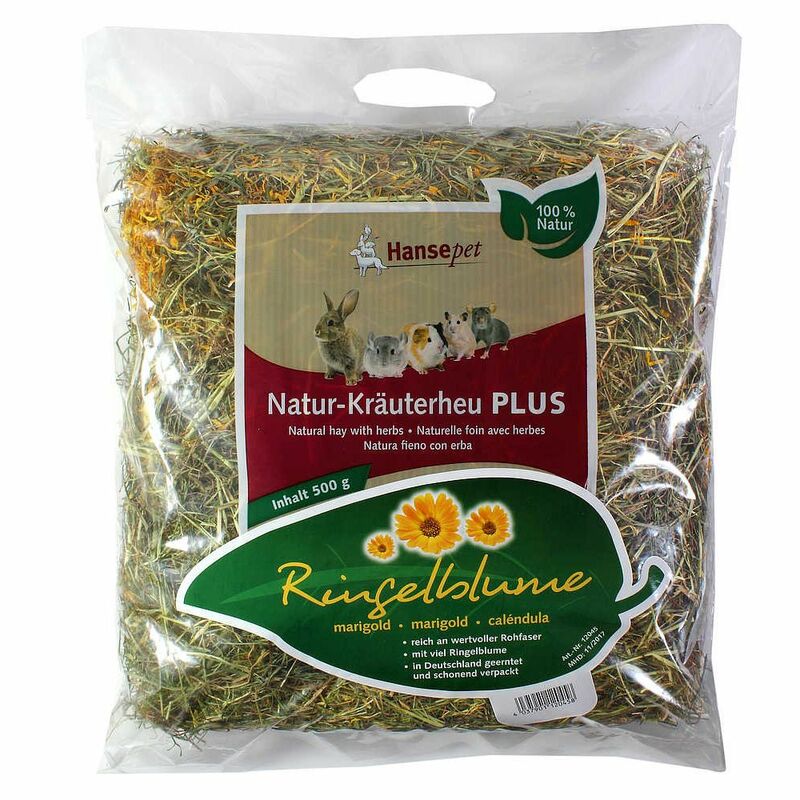 Natural Hay with Marigolds contains a variety of natural vitamins, minerals and trace elements and its high fibre content helps keep your pet's digestion healthy. Also it's rough structure encourages dental abrasion for good dental health. Natural Hay with Marigolds at a glance: A feed for rabbits and small pets With natural hay and flowers Rich in healthy fibres: helps towards healthy digestion for your pet With lots of marigold bloΒoms Hand-picked and carefully packaged Flavoured with yummy herbs Rich in natural vitamins, mineral nutrients and trace elements Rough structure for natural dental abrasion and healthy teeth Harvested in Germany Please note: As hay is a natural product, consistency may vary with the season.